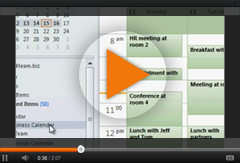 Sync and share calendar folders, appointments and meetings in a few clicks. Synchronize and share Outlook calendar items automatically or manually. Any changes made in the shared Calendar folders while offline will be synchronized automatically as soon as you connect to the internet or local network. Share custom Outlook calendar forms and imported items. Access ShareO from Microsoft Outlook file menu and toolbar. ShareO actions and sharing Wizard are available from right click menu on Microsoft Outlook folders and items. Share different Calendar folders with your coworkers, friends and family. Subscribe your contacts to receive automatic updates of your Outlook Calendar folder. Manage subsribers list and user rights. ShareO features advanced user rights management. You can set "Full access" rights for those who can modify shared content or choose "View only" option if users are not allowed to edit shared data. Filters and advanced options will let you to exclude private data (attachment, comments, notes, private items, etc.) from being shared. Conceal from subscribers or show as blanks your private appointments and meetings. Share Free/Busy time with your coworkers and friends without disclosing the subject and private data. Use Outlook Appointment scheduling tab to view your colleagues' Free/Busy time to schedule Meetings and Appointments more effectively. Create group schedules. Share private appointments without disclosing the appointment subject and other private data, only showing the scheduled time. Other users will see your shared private appointments as blanks.